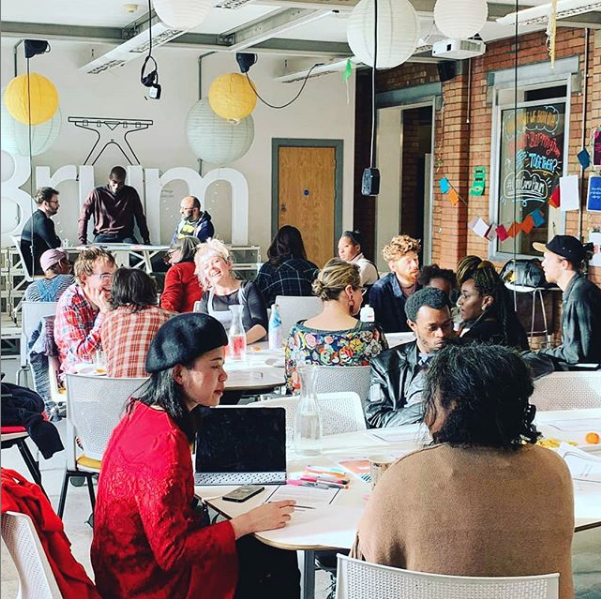 Last Sunday, 3rd February 2019 marked the first of a series of events inviting everyday people to find home in expressing and exploring their passions to create better places to live within their cities; this time Birmingham, UK. This 3 hour meet-up wove together various artists, designers, makers and visionary citizens into a single space in Birmingham’s City Centre; converging these, usually loosely affiliated individuals, in discourse to challenge the status quo, and discuss how best to utilise their unique natures to bring about positive change for one another and the communities they are a part of. Sunday was an afternoon for discovery. Over 20+ citizens from around Birmingham, UK; tutors, property managers, entrepreneurs, artists, poets, furniture designers, student architects, social enterprise managers, parents, food lovers and numerous others met (without the need for titles) to discuss the things they most wanted to create, together. 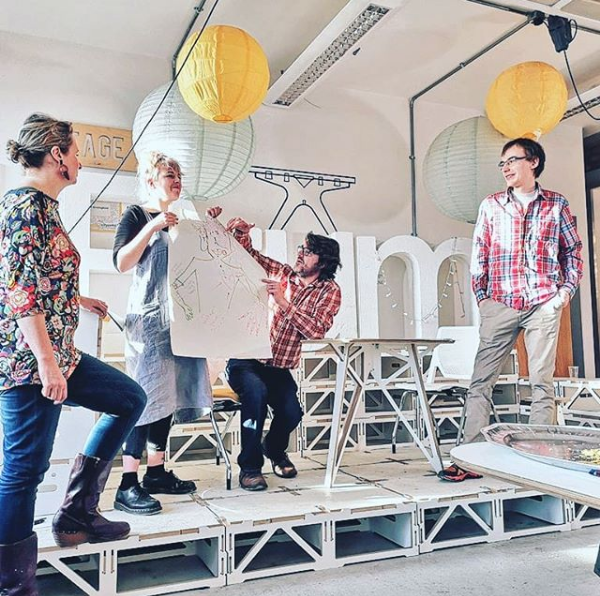 ‘The Loom’ (our theme for this session) would be the embodiment of that ‘safe-space’ to create collectively; imagined to facilitate the drawing the untapped potential of citizens to purposefully hack, design, make and build together. Whether it be a new table which adjusts to a height specifically beneficial for those in wheelchairs or with limited mobility; to creating an ‘urban greenhouse’ kitchen alongside an artistic botanist; or inventing a new wardrobe that can iron your clothes, organise them via an app on your smartphone, and remind you when they need to be washed, members of ‘The Loom’ would be facilitated to explore those desires, and supported to make them reality. The Connected Home; describes the integration, use and development of IOT technologies which are being designed and made to provide for its users an integral connection to a virtual interface through various household objects. Contagious Cities; describes a study originally preformed by The Wellcome Trust, and relates to how the design of our cities can promote the growth of colonies of microbes. In this example we explore the potential good and evils that microbes can place on experience within cities and question their potential implications for our future paces. Family Safe Cities; describes an investigation currently be explored by KIONDO | Community Led Design, in combination with #RadicalChildcare & PlaylabLeeds to uncover the underlying frameworks, principles and experiences required to design a city where intergenerational families (children, parents, elders) can navigate their cities safely, with a sense of ownership and agency. A Circular Economy; describes an economic system which promotes the maximization of resource outputs, whilst simultaneously minimizing system wastage, through practices such as reuse, repair and maintenance. 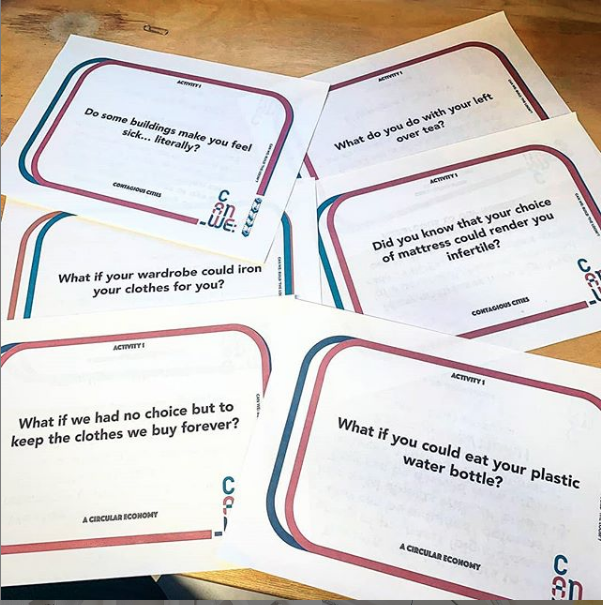 For each of these topics we produced a collection of question cards, distributed evenly across 4 separate tables; designed to inspire thought and debate amongst the guests. Our goal was to aid the participants in forming affiliations with one another, fuelled by conversation sparked by the provocations on the cards. What if you could eat your plastic water bottle? Did you know your choice of mattress could render you infertile? What if you had no choice but to keep the clothes you wear forever? From these affiliations, conversations started, success! We then instructed the congregation to select the table which was home to the topic they were most affiliated to, and to take a seat there. Individuals who had formed associations with people they had become engrossed with prior, tended to sit at the same location where they would continue their conversations about their relationship to their interested topic. In order to further this dialogue, we needed to employ a safe method to support the group in sharing more personal aspects of themselves with each other. Herein, the Characterisationsection shone its light. Starting 1–1 we asked the groups that formed to form pairs (or threes) , and interview one another; encouraging the pairs to focus on recording what they thought of as important characteristics about each other. Delving deeper, the pairs were then set to form groups of 4 with. This time, the intention was to create a fictional character which represented the ideals, characteristic and predilections which that had discovered within each other. After they had created this fictional character, the groups were asked to share them with the rest of the collective. 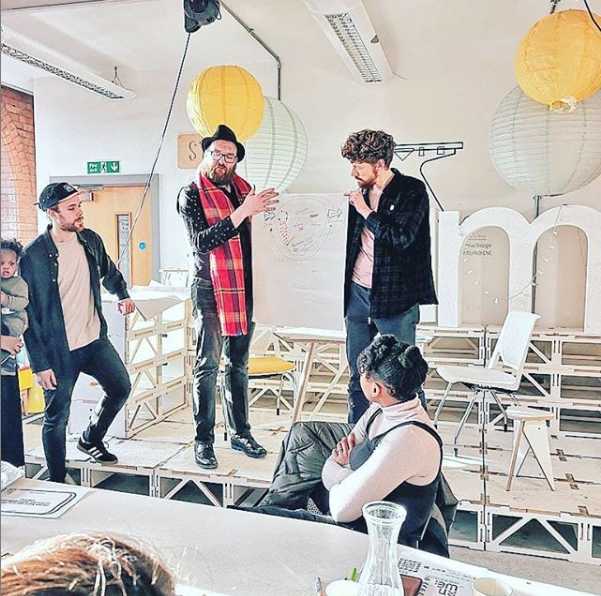 The third and final step, ‘ Activation’ , sought to begin the process to experience these principles in practice by inviting the collective to explore existing projects happening locally to them. These included local co-design & making workshops such as POTPOD19, and technology development for design & fabrication The Fab Factory. To add, the participants were given the chance to share their own projects with the group, in order to gain feedback or rally support, which resulted in many interesting conversations and potential collaborations between some of the guests. However, Activation requires more time. It requires a consistent instances of bringing people together in more focused sessions around their ideas. Therefore, we rounded up the last section early, to allow for conversations, now sparked by the projects being shared, to flow freely as people left to return home. The session demonstrated the potential power of the Loom to bring people together and create synergies between them. Nevertheless, to find out if we can truly build The Loom, we will have to participate in supporting group to build projects together. To accomplish this, we will be hosting more CanWE sessions, this time focused on working through individual projects over the course of a workshop. If you are interested in supporting or pitching a project to be supported in one of these sessions, feel free to contact us on social media, or get in touch via email on build@kiondo.co.uk. For those who enjoyed this writing and want to continue to see more, please leave a comment below and stay connected to our blog/ medium channel. PREVIOUSBuilding a Family safe city?